Lampropeltis triangulum campbelli, commonly known as the Pueblan milk snake or Campbell's milk snake, discovered in 1983 is an egg laying species of nonvenomous colubrid snake. When handled, it discharges a pungent-smelling exudate from its cloaca as a presumed defence mechanism. They have a small blunt head which is about the same size as the neck, black eyes, and a smooth slender body. The Pueblan milksnake has a brightly coloured body with black, red and yellow stripes. They are sometimes confused for coral snakes which are venomous but can be recognised by the colour order of their stripes which is black - yellow - black - red. This can be remembered using the phrase "Red on yellow, deadly fellow; Red on black, venom lack." or "Red on yellow, kills a fellow. Red on black, you're alright Jack." Adult Pueblan milk snakes reach lengths of 36 to 48 inches. 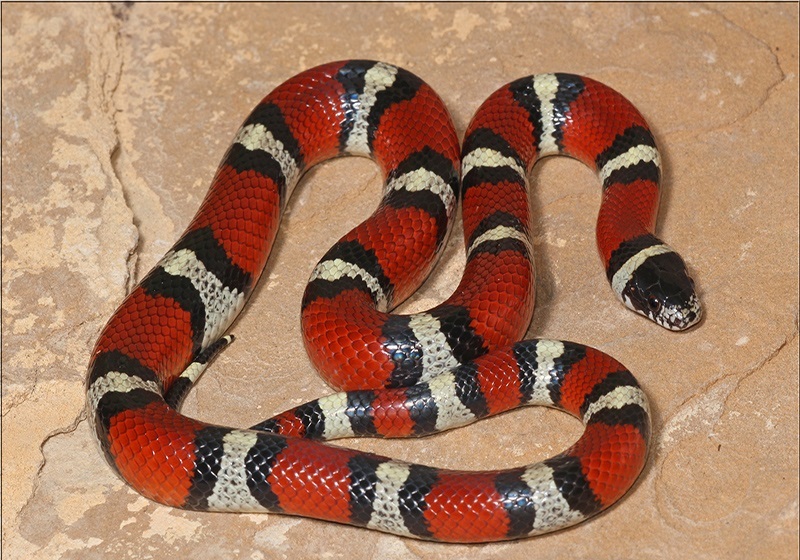 The Pueblan milk snake is found in southern Puebla, eastern Morelos and northern Oaxaca, Mexico. Like most milk snakes, Pueblan milk snakes are nocturnal, especially during the summer months when the heat of the day is often beyond their tolerance. They tend to be flighty and nervous when disturbed by humans. Pueblan milk snakes will feed on anything they can overpower. They will consume prey such as mice, rats, birds, lizards, frogs, and other snakes, including venomous snakes. Click HERE for a Pueblan Milk Snake care sheet.